I also notice it's strapless. Chloe looks great in the photos. There is 1 photo of a large group and a blonde in the spotlight on a raised platform at the back -- looks like Chloe. I think we'll have to wait for it. Lovely dress on a beautiful woman! wow.. she is absolutely stunning!! She looks great. I love her red dress! I think somebody did so well with the bodice decorating. 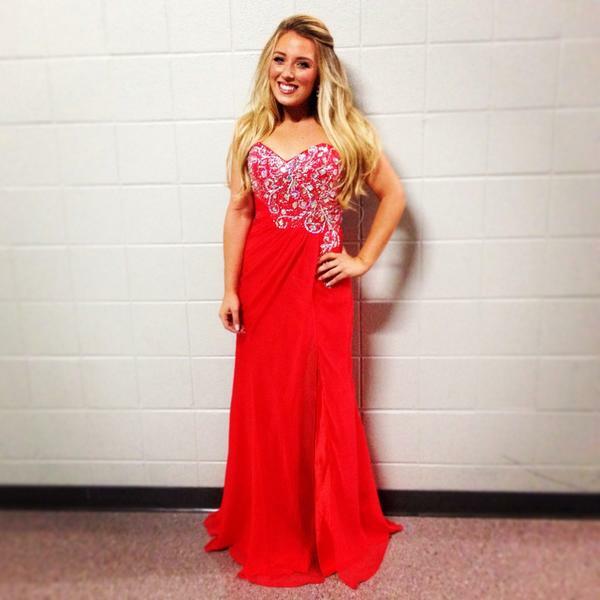 It is very nice, Kimberly, and RED, your favorite color on your favorite Celtic Woman, too. Is that the first red dress she has worn to perform? Is it just me or is that dress totally Synan's style? It totally looks like a dress he'd design. Not a CW dress in particular, but definitely a Synan dress. I've found the recent picture! Now, you may think, this dress is white in further view, but it's actually red if you look closely. She's on the balcony!